Obesity is a medical term used to describe children (and adults) who carry 20 per cent extra body weight. This extra weight, if not treated early on, could cause serious health problems such as arthritis, cancer, heart disease, stroke, diabetes and depression in later life. Help stop obesity before it starts by making sure they eat a balanced diet and get enough exercise. Being overweight is rarely to do with having a medical problem, many children simply have unhealthy diets and don't do enough exercise. It is better to stop your child becoming overweight or obese in the first place. Many parents feel guilty (or in denial) that their child is overweight and ignore it, but this will have a damaging effect on your child in many ways including their physical health, mental health and self-esteem. If your child feels bad about themselves they can comfort eat to make themselves feel better, so leading to them being more overweight - this creates a vicious circle. You are responsible for your child's health and well-being, this includes what they eat. A healthy balanced diet (see the eatwell plate below) and exercise is the simple answer. Try to have family outings which include walking and cycling so you can all get fitter together. Being active burns more energy and the body then starts to use up its fat stores. 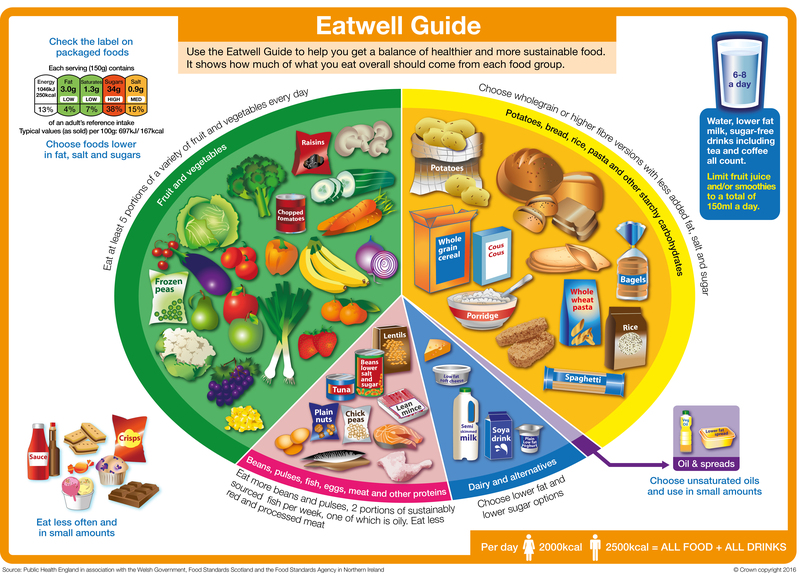 Use the eatwell plate to help you get the balance right. It shows how much of what you eat should come from each food group. (Recommended for children over five). Many parents are unaware of the dangers of childhood obesity but by following the top tips below you can make a difference to your child's health. Sugar Swaps - Swapping sugary snacks and drinks for ones that are lower in sugar can make a huge difference. Meal Time - It's important for kids to have regular, proper meals as growing bodies respond better to routine. Snack Check - Many snacks are full of the things that are bad for us - sugar, salt, fat and calories. So try and keep a careful eye on how many the kids are having. Me Size Meals - It's important to make sure they get just the right amount for their age. Cut Back Fat - Too much fat is bad for us. It's not always easy to tell where it's lurking. Up and About - Most of us spend too long sitting down. Keep active. Encourage your child to walk, you may need to use child safety reins. Get going with the 10 Minute Shake Up! The Change4Life 10 Minute Shake Up is an initiative in partnership with Disney,for families in England, particularly those with children aged 5 to 11. It aims to inspire and help children do at least 60 minutes of physical activity each day, which is the government recommendation. The 60 minutes of activity can be achieved either by doing all the activity in one session, or through several shorter bursts of activity of 10 minutes or more. Get ideas, games, special offers and a free 10 Minute Shake Up pack containing a stopwatch, wall chart and activity cards as well as reward stickers and a host of Disney inspired fun ideas for short bursts of 10 minute exercise. Visit the Change4Life website for more details. Salt and sugar is added to nearly all processed products. Three-quarters of the salt and sugar we eat is already in the food, the rest is what we add to cooking or shake on our meals. Children aged 7 to 10 years need less than 5g of salt a day (around 1 teaspoon). My child looks chubby and seems to only want to eat food. Exercise together as a family and find out more about healthy eating. If you are worried discuss with your GP. www.patient.co.uk/health/obesity-and-overweight-in-adults Advice for patients on obesity and overweight.